Read by millions since its launch in 2004, BLDGBLOG is the leading voice in speculation about architecture, landscape, and the built environment. Now The BLDGBLOG Book distills author Geoff Manaugh's unique vision, offering an enthusiastic, idea-filled guide to the future of architecture, with stunning images and exclusive new content. From underground exploration to the novels of J.G. Ballard, from artificial glaciers in the mountains of Pakistan to weather control in Olympic Beijing, The BLDGBLOG Book is "part conceptual travelogue, part manifesto, part sci-fi novel," according to Joseph Grima, executive director of New York's Storefront for Art and Architecture. "BLDGBLOG is something new and substantially different from anything else I have seen," says Errol Morris, Director of Fast, Cheap & Out of Control and the Academy Award-winning documentary Fog of War. "Secretly, I had always hoped it would become a book. Geoff Manaugh has provided the reader with an excursion into a new world—part digital fantasy, part reality at the intersection of art, architecture, landscape design, and pure ideas. Like the blog, the book is personal, idiosyncratic, and, best of all, incredibly interesting." Geoff Manaugh is a senior editor at Dwell magazine and the founder and author of the popular Web site BLDGBLOG. BLDGBLOG is something new and substantially different from anything else I have seen. Secretly, I had always hoped it would become a book. Geoff Manaugh has provided the reader with an excursion into a new world part digital fantasy, part reality at the intersection of art, architecture, landscape design, and pure ideas. It is personal, idiosyncratic, and, best of all, incredibly interesting. A thousand years from now, looters will comb the rubble of ruined libraries in search of this book to study Manaugh's cubist love stories between humans and the cities they created. If mankind of the early 21st century finds itself brought up before some Supreme Galactic Court and forced to account for its dubious record, I can think of no better submission for the Defense than this extravagantly gifted and brimmingly generous volume of Mr. Manaugh s.
Reading BLDGBLOG is like pulling a wire from under the wallpaper and following it through a series of rooms you never knew you had. A road trip for the intellectually curious. Part conceptual travelogue, part sci-fi novel, part manifesto, The BLDGBLOG Book is above all a profoundly intelligent and inspiring wake-up call to architects, a plea to rediscover the power of imagination and interdisciplinary inquiry. Every now and then you encounter a writer who is so culturally omnivorous and intellectually alert that he enables you to see the world in a whole new way. Consider yourself warned: Geoff Manaugh is that writer. 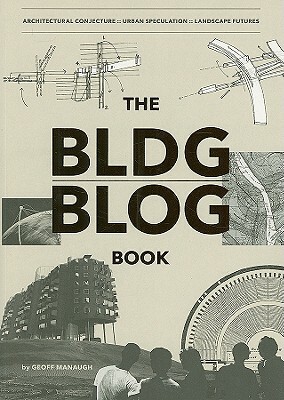 If you re not careful, The BLDGBLOG Book will rewire your brain. How to describe it? Biosecurity, William Burroughs, ominous brown clouds, shards of architecture, sprinkles of experimental fiction, sedimentary layers of geology, photography, ornithology, meteorology let's just say it might be the first book wildly ambitious enough to tell us what the 21st century is about. Drop his name at cocktail parties now before everyone else starts doing it.